Rankaware is an SEO tool that makes keyword rank checking and monitoring fast and easy. This keyword rank checker software performs batch SERP position checking for targeted keywords on Google, Yahoo, Bing and tracks keyword ranking performance over time. Using intelligent self-learning technology, Rankaware is able to provide accurate results in intuitive charts and tables and generate scheduled, professional, customizable SERP report in different formats.Main features include:Check keyword positions in an instant -automatically check all your keyword positions on major search engines (Google, Yahoo, Bing) with a single click;Track ranking performance over time - track rankings changes (up or down) over time and see what actions are making the most impact on rankingsWebsite keyword performance overviews - view all keywords performance in a glance and understand how your website is doing with all the keywordsOn schedule, branded, professional reports - send scheduled, very professional, stylish SERP report with intuitive charts and tables to your clients. Reports are fully customizable report with your company information.Cross platform full function accessibility- access full functionality of Rankaware from anywhere on any devices, with separate versions supporting different operating systems. Trendy UI & Guaranteed Accuracy - Using intelligent self-learning technology and world-class UI design, Rankaware is able to provide accurate results in well-organized structure. Added delay setting to control the delay between each query for all search engines; Improved Google rank checking algorithm; Improved Yahoo rank checking algorithm; Improved Bing rank checking algorithm; Other minor bug fixes. An extremely easy to use AdWords suggestion and research software. 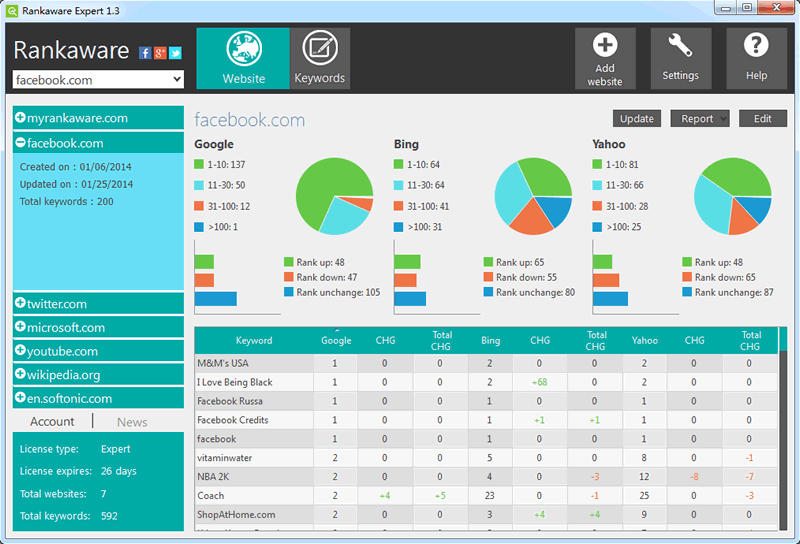 With it, you will quickly discover your target keywords with low competition and high demand. Such information is essential for everyone who use Google AdWords. Web site submission software for commercial, demo, freeware and shareware authors and publishers. Sophisticated, feature-rich software makes the otherwise arduous process of submission much easier and less time-consuming. The Ranking Toolbox is a complete kit of useful tools:It dynamically analyses search engines, detects ranking criteria and provides hints on how to optimise your website. It also compares the position of your website with that of your competitors.